Woodland Park Zoo Blog: Welcome, Xerxes! We have a new king on the savanna! 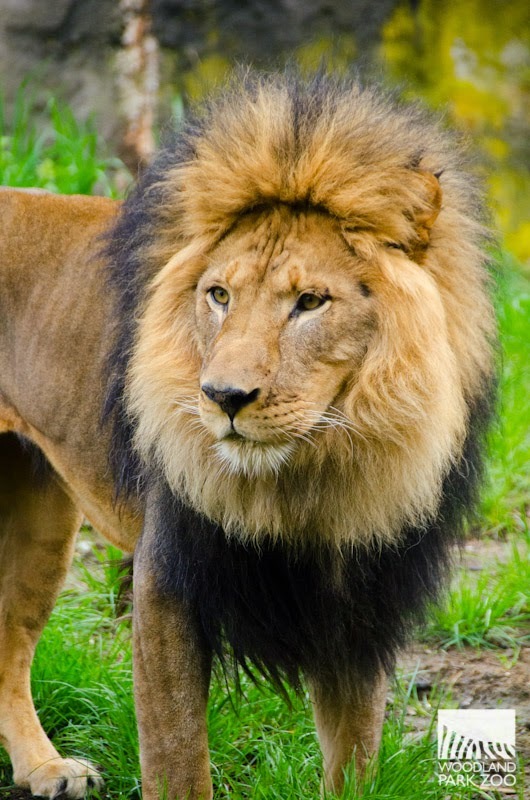 Welcome our new male South African lion, Xerxes, to Woodland Park Zoo’s lion exhibit. The handsome new king on the savanna. Photo by Ryan Hawk/Woodland Park Zoo. Xerxes is 6.5 years old and was born on November 6, 2007 at Oklahoma City Zoo. 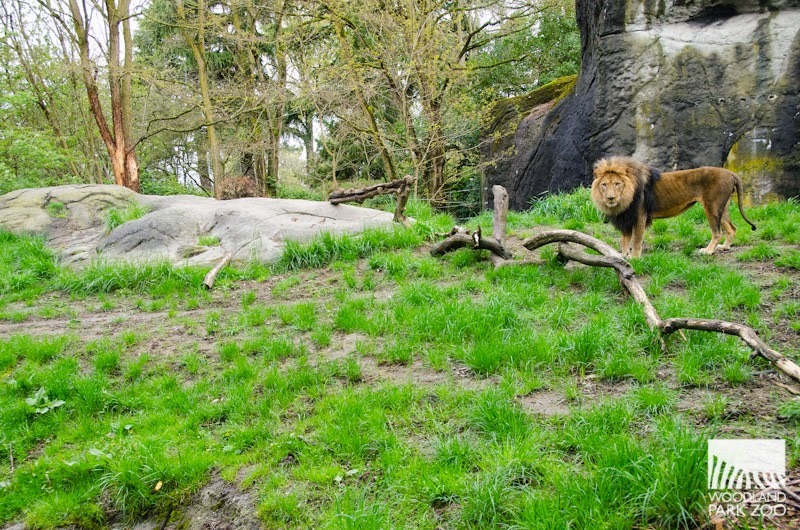 He lived at El Paso Zoo from January 2010 until he came to Seattle in March 2014. He has been behind the scenes in standard quarantine for newly arrived animals, where he received health checkups and an assessment from our animal health staff before being introduced to the exhibit. This week he began his first ventures into the main outdoor lion yard. We watched from the lion viewing shelter as he gingerly entered the outdoor space and began to explore. Keepers say he is a very calm lion, and they expect him to settle into his new environment without any trouble. Xerxes is very striking, with his dark-tipped mane and regal expression! Xerxes is also exceptionally vocal. He roars like other lions do, but he also does a lot of low grumbles, high pitched moans, and a chuffing sound similar to a tiger. He is very talkative with his keepers and Adia, our female lion. Stepping out. Photo by Ryan Hawk/Woodland Park Zoo. Xerxes is being introduced to the exhibit on his own so he can feel out his new turf, but soon he will join female Adia. Keepers say the two have shown very positive signs for a smooth introduction such as vocalizing to each other while in their behind-the-scenes dens. After their introductions are complete, you will be able to see this new pair hanging out together. We have high hopes that this pair might rear a litter of lion cubs, especially since as of yet, Xerxes is not represented in the gene pool for the lion Species Survival Plan conservation breeding program. Adia gave birth to four lion cubs in November 2012. 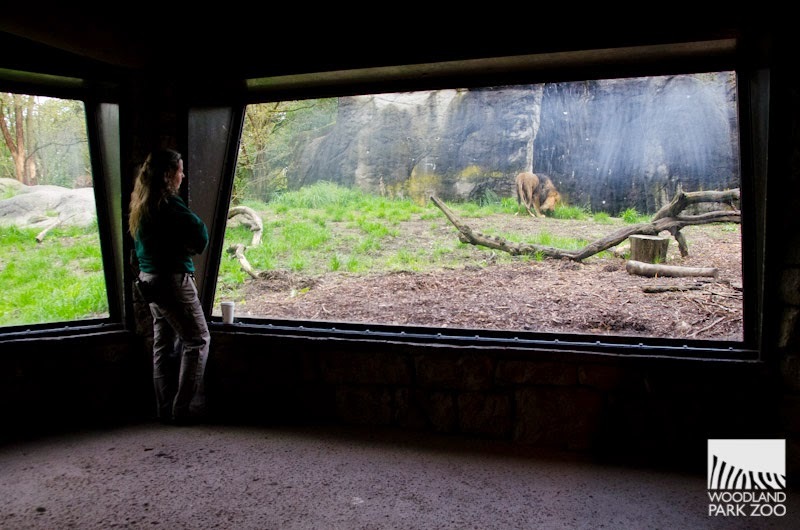 Keepers take turns keeping an eye on the new lion, making sure he is able to successfully navigate his new home. Photo by Ryan Hawk/Woodland Park Zoo. Xerxes will be on exhibit daily from 9:00 a.m. to noon. If everything goes according to schedule, introductions with Adia will begin the week of May 5th. You may be distracted by that glorious mane, but check out Xerxes’ tail! The lion tail is the only one in the cat family with a tassel at the tip. The tassel conceals a spine, or tail bones fused together. It’s not clear what the purpose of this spike on the tail is used for, but we think it looks pretty awesome. Lions use their tails for balance, and especially for signaling to cubs and even other lions during a hunt. 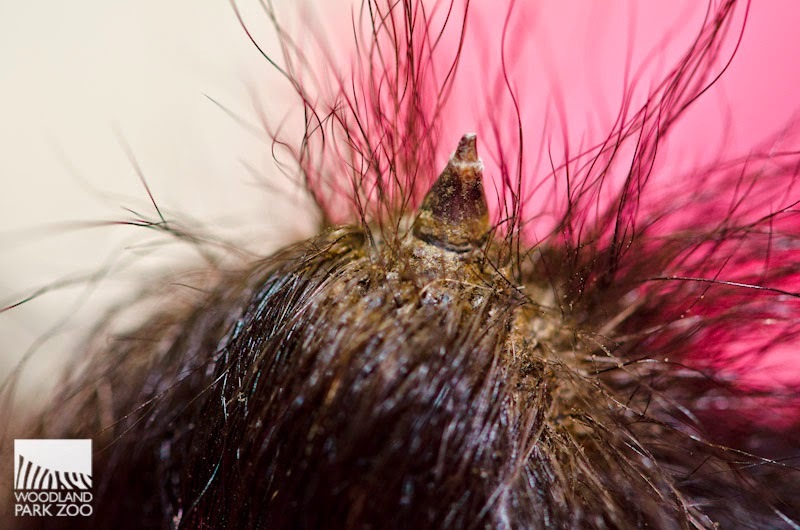 Pulling the tassle of hair away from the tip of Xerxes’ tail during an animal health exam. You can see the spiky end that is usually hidden! Photo by Ryan Hawk/Woodland Park Zoo. Xerxes is an amazing lion. I have had the luxury of watching him grow the past 3 years I've lived in El Paso, TX and now I will get to view him again in his new home while I am back in Washington for a visit!